Providing up to 4 PoE, in-line power interfaces, the switch can easily build a power centrally-controlled IP phone system, IP camera system and AP group for the enterprise. For instance, 4 cameras / APs can be easily installed around the corner in the company for surveillance demands or build a wireless roaming environment in the office. Without the power-socket limitation, the switch makes the installation of cameras or WLAN APs easier and more efficient. Providing 8 10/100BASE-T PoE ports, in-line power interfaces and two Gigabit TP/SFP Combo interfaces, the FGSD-1008HPS can easily build an IP surveillance system in which its power is centrally controlled for the enterprises. It can work with one 8-channel NVR to perform comprehensive security monitoring with 8 IP cameras via one Gigabit TP/SFP Combo port. Comes with non-blocking design, desktop size and SFP fiber-optic modules, bringing network infrastructure to higher flexibility. Rapid Spanning Tree Protocol for Efficient Network System. FGSD-1008HPS features strong rapid self-recovery capability to prevent interruptions and external intrusions. The Hibernation Link Down power saving goes beyond IEEE specifications to automatically lower power for a given port when it is not linked. SOHO/HOME-Use Gigabit Ethernet PoE Network Deployment. GSD-908HP 802.3at PoE+ Switch helps SOHO/home users to create an integrated data, video, and powered network. Wireless AP and PoE IP camera devices work with the GSD-908HP, which injects power through the cables, thus helping SOHO/HU to build a reliable PoE networking environment. Ideal Solution for Securing IP Surveillance Infrastructure GSD-908HP 802.3at PoE Switch is positioned as a Surveillance Switch for quick and easy PoE IP camera deployment with power feeding. Provides both 802.3af and 802.3at PoE functions along with 8 10/100/1000BASE-T ports featuring 15.4-watt 802.3af and 30-watt 802.3at PoE in RJ45 copper interfaces and 1 extra Gigabit TP interface supporting high-speed transmission of surveillance images and videos. Providing four 802.3at PoE+ in-line power interfaces, the GSD-804P can easily build a power source that centrally controls the enterprises’ IP phone systems, IP camera systems and wireless AP systems. For instance, up to 4 cameras can be installed around the corner in the company for surveillance demands or up to 4 wireless APs can be built to have a wireless roaming environment in the office. Without the power-socket limitation, the GSD-804P makes the installation of cameras or wireless APs more easily and efficiently. For the growing Gigabit network and IoT (Internet of Things) demand, PLANET has launched a new-generation Web Smart 1/10 Gigabit Switch solution, the GS-2240 switch series, to meet the needs of enterprises, telecoms and campuses for a large-scale network deployment. The GS-2240-24T4X is a Layer 2 Web Smart Switch, which comes with 24 10/100/1000Mbps Gigabit Ethernet ports and 4 10G SFP+ uplink slots. The GS-2240 switch series also provides a quick, safe and cost-effective 1/10G network solution for small and medium-sized businesses. PLANET’s latest Layer 2+ Managed Core Fiber Switches. High-density performance and support IPv4 and IPv6 hardware Layer 3 static routing and 24 100/1000Base-X dual-speed SFP slots in a 1U case. With these ideal features, they are able to cross over different VLANs and different IP addresses for a highly-secured, flexible management and long-reach networking application. As a fiber backbone switch, they can flexibly work with suitable SFP transceivers to have a long connection of up to 120km via optic fiber cabling. For SMBs, campuses and enterprises for their backbone and workgroup network applications by providing affordability, high performance, long distance and stable transmission quality. PLANET SGS-6340-16XR is a Layer 3 Stackable Managed Gigabit Switch that provides high-density performance via its Layer 3 10Gigabit static routing with 16 SFP+ fiber interfaces delivered in a rugged case. The administrator can flexibly choose a suitable SFP/SFP+ transceiver according to the transmission distance or the transmission speed required to extend the 10G network efficiently. Besides, with the 320Gbps switching fabric, the SGS-6340-16XR can handle extremely large amounts of data in a secure topology linking to backbone or high capacity servers for enterprises, data centers, campuses and so on where VoIP, video streaming, and multicast applications are utilized. 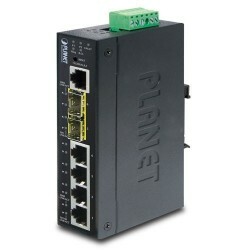 PLANET’s newly-launched Renewable Energy Industrial 802.3at PoE Managed Ethernet Switch, BSP-360, is designed for deploying a surveillance or wireless network and remotely monitoring and managing the IP-based devices. Based on its green technology, the BSP-360 can be charged by the inexhaustible and natural source of energy, such as solar, wind and hydroelectric power to conserve energy so as to economically power these remote IP cameras and wireless APs, especially used for such expansive applications as dams, forests, deserts, national parks, nature/animal protection areas and highways.